Well hello lovelies, my my my I’ve had one of those weeks! It was like the week where the straw broke this camels back. Oh yes! But after what felt like a complete breakdown i had the most wonderful enlightenment afterwards. You know. finally seeing that silver lining. Let me start, on Friday i was out shopping and i lost my phone, in Matalan of all places. I was devastated. It sounds silly now, but i do everything on that phone. There were photos of my son on that phone i will never get back, there were little messages i will never see again and just general inconvenience of it all. I broke down in to tears and couldn’t stop. The flood gates were well and truly open. I had felt for the past two weeks that my life was on some kind of downward spiral and i was out of control and well… unhappy. It took for me to loose my phone and open those flood gates for me to re evaluate things. For me to sit and think. I do put to much importance on the material world. I do stress over things that i can not change. I had lost all patience with my son and life. I think everything happens for a reason, and even though it was totally crappy that i lost my phone (and what’s more annoying is that no one handed it in) , i have really done some soul searching. I have taken a breather. I have learnt lessons. And now. Now i feel so much better. I mean, I’m taking each day a time. I’m giving my son the patience he deserves. I am sitting and enjoying things rather than panicking constantly. It feels good. SO yes that’s why I’ve been a little absent over here lately, hope you forgive me? Normal programming will resume soon! Anyway i’m off to do some work and go visit some of the other EBEW’s. 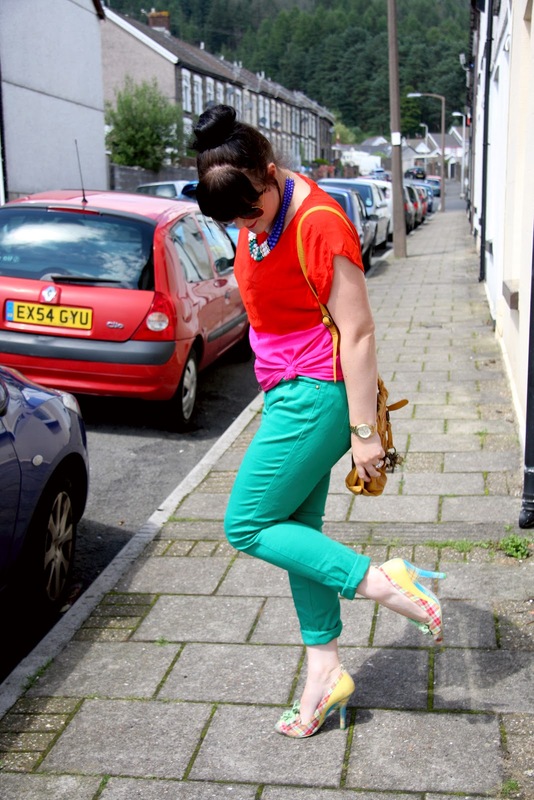 Ps the only other time i did colour blocking and is probably a personal favourite! It's funny how something simple like losing a phone can lead to major life re-evaluation, but it happens to all of us at some point. I think I'll take heed from your story and back my phone up! I haven't done that in a while! This shirt + that necklace are all kinds of gorgeous. Awww Rachel I'm so sorry to hear you had a serious bummer of a day – I had the same floods of tears when I ruined my mint chinos (did you read about my mint chinos debacle of 22 June? )… I think because I had tried on soooooo many new pairs and finally found a pair that fitted me. It took the tears to realise that I'd been overeating and letting the exercise slip (I get a lot of headaches, don't sleep well etc. if I'm not being healthy). So it kickstarted me back into my good habits I'm pleased to say, your story sounds very similar to the way I was feeling!!! Anyway I'm glad you're a happy bunny again – though your bright colours haven't ceased to impress!! You said you weren't keen on this outfit but you really stand out on EBEW, you're the primary colours queen sweetie! The trousers are faaaaabulous on you, I think that's my no.1 colour this year. Well done on jumping out of your comfort zone to colorblock! When I went to do this challenge, I realized I didn't have many pants more interesting than jeans, and I missed my dresses too! Glad I found you and I'm a new follower! 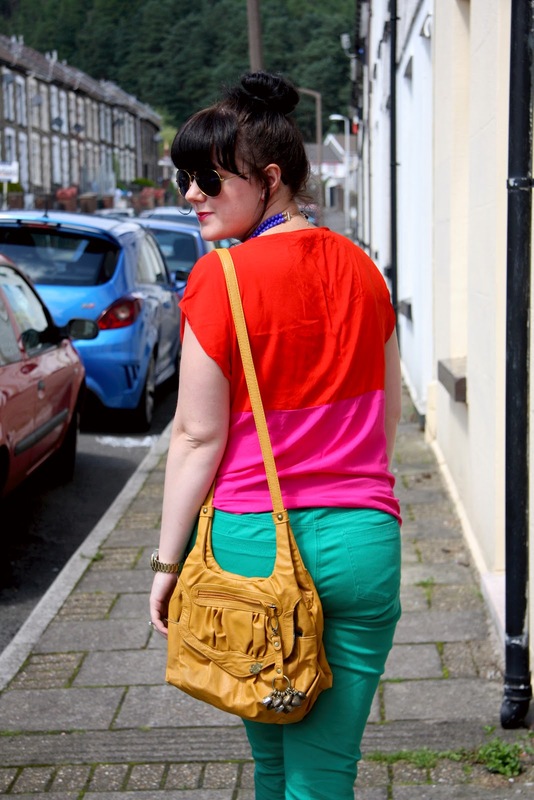 I love colorblocking! You look so pretty! Oh 🙁 My poor deshooshy. I'm so sorry to hear all of that, but so impressed that you were able to turn your whole outlook around in such a short amount of time. I also really admire your ability to open up about something so personal on your blog. I rarely am able to share things like that with my readers; I'd rather talk about how I want to be naked than to say what's really on my mind sometimes. I know it takes a lot of courage and I applaud you for it. 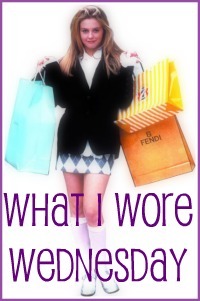 Also, even though you don't love this outfit, I abso-freaking-lutely do!! I mean, realllly love it!! I am jealous that you have those jeans & that top and that I do not. I think the super, extra bright colors suit you so well. You look beautiful, my darling!! So sorry about your rough two weeks, but it does sound as if thing are better now. Also sorry you don't love this outfit. I adore the fact that you used a color-blocked top and added another color with the pants. You look wonderful! Aww Bummer but you look great! Cute – I did wonder where you had gone! A cheerful and bright outfit also affects my mood for the better. When I'm appropriately and stylishly dressed, I definitely feel at my best! 🙂 It's funny how much what you're wearing can affect your mood. If it is any consolation, this outfit is AMAZING. I'm sorry you had to kind of break down to get to a new point, but I can totally relate. In other news, our wardrobes are opposites! I hardly have any patterns compared to solid colors and I hadn't even really thought of how solids dominate my wardrobe! Hello! Just popped over from EBEW… Wow. All of that enlightenment over a lost phone. I think I'll have one of those! Not really, but then again, yes. I am a new stay at home mom with the birth of my second son (16 mo–whoa time flies! ), but I am with you 100%. It can be really just SO hard some times. I love both of my boys to pieces, but some days I just cry as the way to channel all of my emotion vs. let loose on them. It is HARD work. At any rate, I am glad you are feeling better and it sounds like a miraculous lesson. So… your outfit is what caught my eye. Color blocking to a new level. LOVE!! I am obsessed with color, and I think this is a ball out of the park. Thrilled to have found you. I absolutely LOVE the way you color blocked – those colors were made for each other! 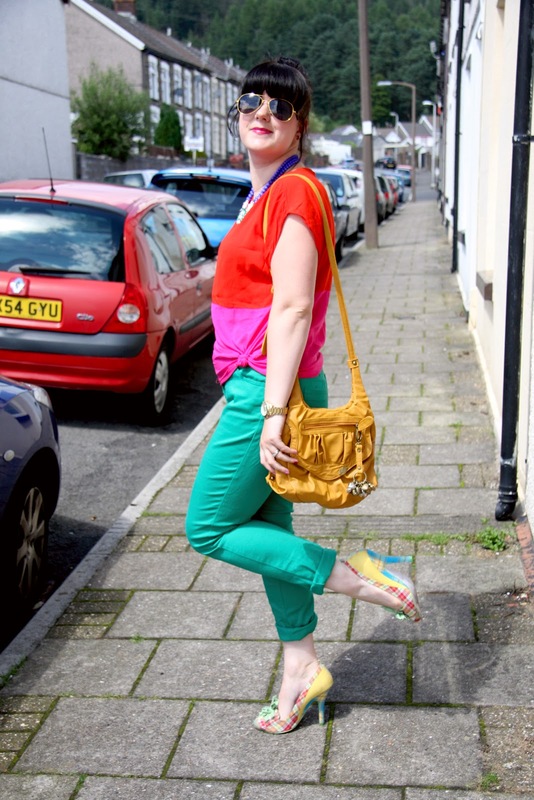 Colour blocking in style indeed, Rachel. love the color combo – i love when people can pair red + green without looking like christmas! Sorry you had a tough week. I hope this week is better. You look super-cute in that outfit. Love the colors. I'm so sorry you've had a tough week. You are such a positive person though – I'm glad you are bouncing back. 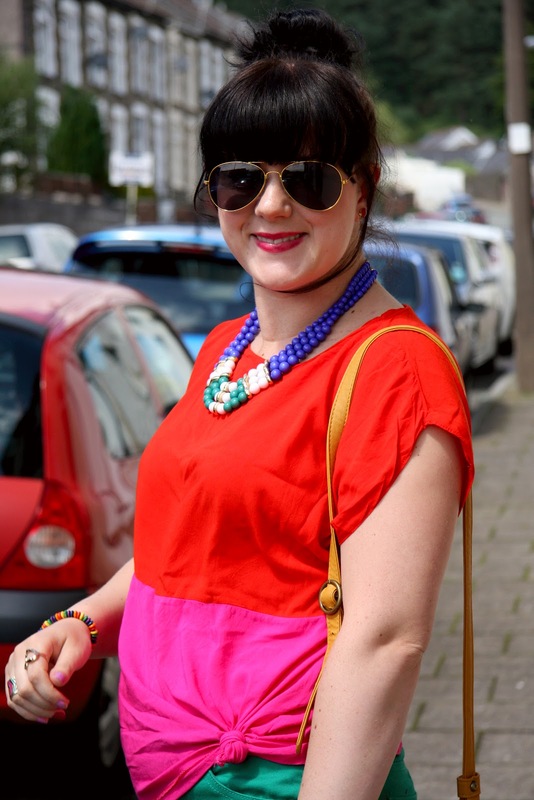 I personally lvoe you colour blocking – although I am 100% a patterns girl too. Nice to meet you Rachel. Sorry to hear that you've lost your phone. Hope you replace it with a new one soon. 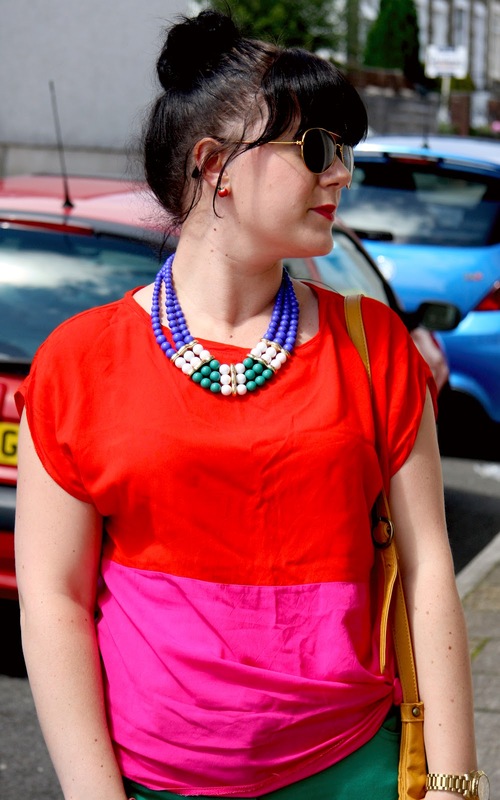 Love your top and necklace! Very colorful. oh honey, I am sooo sorry about your lost phone. 🙁 I too would be devastated. I completely feel for you. At least you still look flippin' fantastic, cause you do!! 😉 Those shoes??? Love them! Such fun colors! It's always great to play around and try new things! 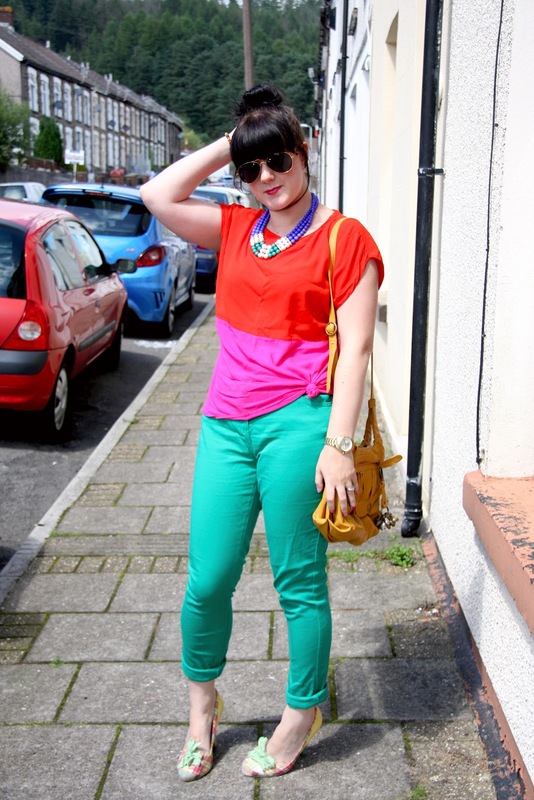 Some really great colour blocking there! Looking gorgeous! Love the bright colors! You definitely rock the color blocking trend. Love those jeans. I would feel pretty sad if I lost my phone too. But I know what you mean about the soul searching and re-evaluating things, getting them in perspective. I usually find every few weeks that I have to let the online world go for a bit, otherwise everything else in my life suffers. Do your neighbours ever comment on all your photo taking and funky outfits? Sorry to hear about your phone! 😉 Glad though to hear you're dealing with it. Oh I love Irregular Choice. I've got some denim shorts the same colour as those jeans, love them! Girl, I am loving all that gorgeous color!